Objective: The Ethnobotanical studies and folklore claiming reviewed that the leaves and bark of the plant Psidium guajava Linn. are used for antiinflammatory activity. From the literatures we found that poly-phenolic compounds like tannin have significant free radical scavenging activity in bacterial associated diseases. Based on the above information of Psidium guajava is selected for this Research work. • To separate the tannin fraction from the Psidium guajava Linn. leaves and bark. • To study the anti-bacterial activity of tannin fraction of Psidium guajava separated from leaf and bark. The Medicinal plants are of great value in the field of treatment and cure of disease. Over the years, scientific research has expanded our knowledge of the chemical effect and composition of the active constituents which determine the medicinal properties of plants. India is an ancient heritage of traditional medicine. Materia medica of India provides a lot of information on the folklore practices and traditional medicine based on various indigenous system including Ayurveda, Siddha and Unani [1-3]. In western medicine continues to show the influence of ancient practices. More recently, there has been interest in other products from traditional systems of medicine artemisinin is an active anti-malarial compounds isolated from Artemisia annua, a constituent of the Chinese anti-malarial preparation qinghaous and forskolin was isolated from Coleus forskohlii, a species used in ayurvedic preparations for cardiac disorders [4, 5]. A new standardized preparation, artemether has recently been introduced for treatment of drug resistant malaria, and new analogues of Forskolin are being tested for a variety of uses. Nature has provided an excellent storehouse of remedies to cure all the ailments of mankind. In ancient days, almost all the medicine used was from natural sources, particularly from plants and plants continue to be an important source of new drugs even now . The importance of biological, chemical and pharmacological evaluation of plants derived agents used in the treatment of human ailments has been increasingly recognized in the last decades. In the next of our series on far eastern plant we look at guava or Psidium guajavaLinn. In folk medicine, extracts of roots, bark and leaves are used to treat gastroenteritis, vomiting, diarrhea, dysentery, wounds, ulcers, toothache, cough, sore throat, inflamed gums, and a number of other conditions. This plant seemed worthy of an in depth review [8,9]. The term "tannin" by extension is widely applied to any large polyphenolic compound containing sufficient hydroxyls and other suitable groups (such as carboxyl’s) to form strong complexes with proteins and other macromolecules. The compounds are widely distributed in many species of plants, where they play a role in protection from predation, and perhaps also in growth regulation. Tannin is distributed in species throughout the plant kingdom. They are commonly found in both gymnosperms as well as angiosperms. Botanically, tannins are mainly physically located in the vacuoles or surface wax of plants [11,12]. Tannins are found in leaf, bud, seed, root, and stem tissues. An example of the location of the tannin in stem tissue is that they are often found in the growth areas of trees, such as the secondary phloem and xylem and the layer between the cortex and epidermis. Tannin may help to regulate the growth of these tissues. The anti-inflammatory effect of tannin helps to control all indications of gastritis, esophagitis, enteritis, and irritating bowel disorders. Diarrhea is also treated with an effective astringent medicine that does not stop the flow of the disturbing substance in the stomach; rather, it controls the irritation in the small intestine. Tannin not only heals burns and stop bleeding, but they also stop infection while they continue to heal the wound internally. The ability of tannin to form a protective layer over the exposed tissue keeps the wound from being infected even more. Tannins are also beneficial when applied to the mucosal lining of the mouth . Tannin can also be effective in protecting the kidneys. Tannin has been used for immediate relief of sore throats, diarrhea, dysentery, hemorrhaging, fatigue, skin ulcers and as a cicatrizant on gangrenous wounds. Tannin can cause regression of tumors that are already present in tissue, but if used excessively over time, they can cause tumors in healthy tissue. Tannins are used indirectly as molluscicides to interrupt the transmission cycle of schistosomiasis[15-18]. They have also been reported to have antiviral effects. When incubated with red grape juice and red wines with a high content of condensed tannin, the poliovirus, herpes simplex virus, and various enteric viruses are inactivated. Tannins are sometimes used to treat poisons from poison oak or from bee stings, causing instant relief. Tannin has shown potential anti-viral, antibacterial and anti-parasitic effects . It is believed that tannin isolated from the stem bark of Myracrodruon urundeuva are of neuro protective functions capable of reversing 6-hydroxy dopamine induced toxicity . The plant has shown promising futures for therapeutic use, which may be of benefit to neuro disease patients. Souza et al. discovered that the tannin isolated from the stem bark also has the antiinflammatory and anti-ulcer potency on rodents, showing a strong anti-oxidant property for possible therapeutic applications Foods rich in tannin can be used in the treatment of HFE hereditary hemochromatosis, a hereditary disease characterized by excessive absorption of dietary iron resulting in a pathological increase in total body iron stores [21-24]. The antimicrobial activity of plant extracts and phytochemicals was evaluated with antibiotic susceptible and resistant microorganisms. In addition, the possible synergistic effects when associated with antibiotics were studied . Extracts from the following plants were utilized: Achillea Millifolium (yarrow), Caryophyllus aromaticus (clove), Melissa offficinalis (lemonbalm), Ocimun basilucum (basil), Psidium guajava (guava), Punica grantor (pomegranate),Rosmarinus officinalis (rosemary), Salvia officinalis (sage), Syzygyum joabolanum (jambolan) and Thymus vulgaris (thyme). The phytochemicals benzoic acid, cinnamic acid, eugenol and farnesol were also utilized . The highest antimicrobial potentials were observed for the extracts of Caryophyllus aromaticus and Syzygyum joabolanum, which inhibited 64.2 and 57.1% of the tested microorganisms, respectively, with higher activity against antibiotic-resistant bacteria (83.3%). Sage and yarrow extracts did not present any antimicrobial activity. Association of antibiotics and plant extracts showed synergistic antibacterial activity against antibiotic-resistant bacteria [27,28]. The results obtained with Pseudomonas aeruginosa was particularly interesting, since it was inhibited by clove, jambolan, pomegranate and thyme extracts. This inhibition was observed with the individual extracts and when they were used in lower concentrations with ineffective antibiotics . Representative condensed and hydrolyzable tannin and related simple phenolic were evaluated as biological anti-oxidants using cyclic voltammetry, the metmyoglobin assay, and the deoxyribose assay. The redox potentials of the tannin were similar to those of structurally related simple phenolic . However, the tannin was 15-30 times more effective at quenching peroxyl radicals than simple phenolics or Trolox. One of the tannin, polygalloyl glucose, reacted an order of magnitude more quickly with hydroxyl radical than mannitol. These results suggest that tannin, which are found in many plant-based foods and beverages, are potentially very important biological antioxidants [31,32]. medicinal plants from which they are isolated. The structural complexity and conformational properties of the lower molecular weight oligomers have been investigated thoroughly, while the chemistry of the polymers still remains a difficult topic . Shikimate-derived phenolics like flavonoids and tannin are widely distributed in plant kingdom and are thus not of interest as classificatory tool; oxidation levels however are indicative in the attribution of evolutionary status among phyla and within each phylum. The main biological and pharmacological effects reported for condensed tannin can be classified into antibacterial and antiviral activities, enzyme inhibition, anti-oxidative effects, anti-mutagenic and anti tumoral properties, next to some more specific interactions e.g. with vascular and cardial systems and inflammation processes . Their anticipated interaction with biological systems originates in principle directly from the physical and chemical properties of the polyphenolic skeleton, although prominent individual differences have been observed [35-37]. The plant specimen (Leaves and bark) for the proposed study was collected during the month of July 2010 from the garden of Vels university, Pallavaram, Chennai. It was identified and authenticated by Dr.P. Jayaraman, Director of Plant Anatomy research center (PARC), Tambaram, Chennai. A voucher specimen No. PARC/2010/594 has been deposited for further reference. The leaves and bark of Psidium guajava Linn were shade dried and coarsely powdered. About 300 gm of powdered drug was extracted with ethanol by cold maceration method after 72 hrs. of maceration it was filtered. After complete extraction the extraction was concentrated by distilling off the solvent and then evaporated to dryness under reduced pressure using vaccum flash evaporator. Then it was extracted successively with solvents of increasing polarity such as petroleum ether, chloroform, ethanol and aqueous it’s to yield its fraction. All the fractions were evaporated under vaccum its color and consistencies were observed.Percentage yield was calculated on the air dried basis [38,39]. The results were tabulated in Tables 1-3. Table 1. The percentage yield of Psidium guajava leaves. Table 2. The percentage yield of Psidium guajava bark. Table 3. Isolation of tannin fraction. The leaf and bark tannin fractions were subjected to qualitative phytochemical test for identification of constituents . The results shown in Tables 4-6. Table 4. Phytochemical screening of Psidium guajava leaf. Table 5. 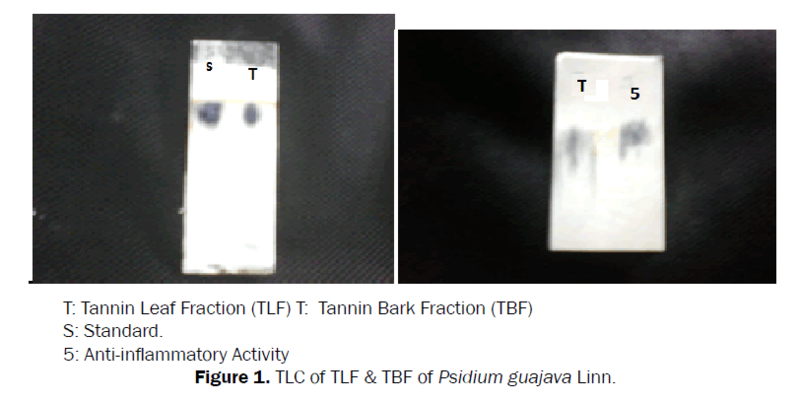 Phytochemical Screening of Psidium guajava bark. Table 6. Phytochemical Screening of Psidium guajava Leaf and Bark (Dried powder). Thin layer chromatography is an important analytical tool in the separation, identification and estimation of different components. Here the principles of separation are adsorption and partition. The stationary phase acts as an adsorbent. Depending on the particular type stationary phase, its preparation and use with different solvent can be achieved on the basis of partition or a combination of partition and adsorption. The adsorbent used for thin layer chromatography was silica gel G, About 25 gm of silica gel G was taken in a glass mortar and about 35 ml of distilled water was added to it. The mixture was stirred with glass rod until it become homogeneous and allowed to swell for 15 min. 15 ml of distilled water was added to it with stirring. The suspension was then transferred to a 150 ml flask fitted with a stopper and was shaken vigorously for about 2 minutes. This suspension was then uniformly speeded immediately on thin layer chromatographic plates. The freshly coated plates were then air dried and stacked in a drying rack and were heated in an oven for 30 min at 110°C. Activated plates were kept in a desiccators, till required for further use. 10 mg of test sample of TLF and TBF was dissolved in 5 ml of 95% ethanol. 1 μl was applied as a spot. 10 mg of Gallic acid (pure sample) was dissolved in 5 ml of ethanol. 1 μl was applied as a spot. The samples was applied in the form of spot, the spot was applied with the help of fine capillaries. Spot was marked on the top of the plate for their identification. Chromatographic rectangular glass chamber was used in the experiments. To avoid insufficient chamber saturation and the undesirable edge effect, a smooth sheet of filter paper was placed in chromatographic chamber in U shape and was allowed to be soaked in the developing solvent. Having been moistened, the paper was then pressed against the walls of the chamber, so that it adhered to the wall. The experiment was carried out at room temperature in diffused day light. A number of developing solvent systems were tried, but the satisfactory resolution was obtained in the solvent systems mentioned in the Table 5. After development of plates, they were air-dried and number of spots was noted and R f Values were calculated. Spots were visualized by UV chamber after spraying the detecting agent. The results of TLC presented in Table 7 and shown in Figure 1. Table 7. Thin layer chromatography of leaf and bark fraction of Psidium guajava Linn. Figure 1. TLC of TLF & TBF of Psidium guajava Linn. Inflammation was the complex biological response of vascular tissues to harmful stimuli, such as pathogens, damaged cells, or irritants. Inflammation is a protective attempt by the organism to remove the injurious stimuli as well as initiate the healing process for the tissue. In the absence of inflammation, wounds and infections would never heal and progressive destruction of the tissue would compromise the survival of the organism. However, chronic inflammation can also lead to a host of diseases such as hay fever, atherosclerosis, and rheumatoid arthritis. It is for that reason that inflammation is normally closely regulated by the body. Acne vulgaris is one of the most common skin diseases caused due to pus forming organisms that trigger inflammation in acne. So, the present have designed to study in-vitro anti-inflammatory activity. The principle involved here is stabilization of human red blood cell membrane by hypo tonicity induced membrane lysis . The assay mixture contains 1 ml phosphate buffer [pH 7.4, 0.15 M], 2 ml hypo saline [0.36%], 0.5 ml HRBC suspension[10% v/v]) with 0.5 ml of plant extracts of various concentrations (31.25, 62.5, 125, 250, 500, μg/0.5 ml), standard drug diclofenac sodium (31.25, 62.5, 125, 250, 500 μg/0.5 ml) and control [distilled water instead of hypo saline to produce 100% hemolysis] were incubated at 37°C for 30 min and centrifuged respectively. The hemoglobin content in the suspension was estimated using spectrophotometer at 560 nm. The percentage hemolysis produced in the presence of distilled water was taken as 100%. The results were tabulated in Figures 2 and 3 [48-52]. Figure 2. 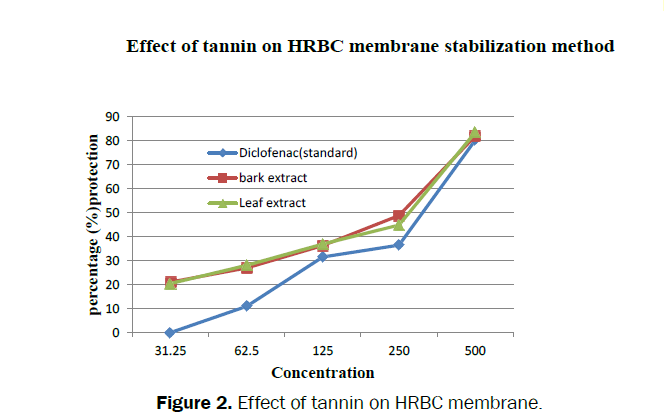 Effect of tannin on HRBC membrane. Figure 3. 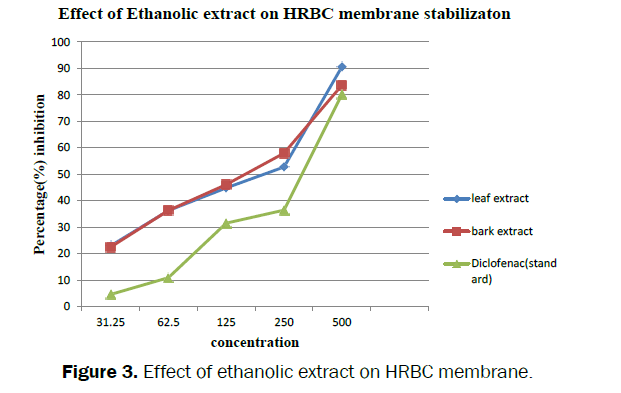 Effect of ethanolic extract on HRBC membrane. The present work covers study on anti-inflammatory and wound healing activity of the leaves and bark of Psidium guajava Linn. The successive extraction leaves of Psidium guajava Linn. was done in the order of increasing polarity i.e. Petroleum ether, Chloroform, ethanol and aqueous (Tables 1-3). The phytochemical test was carried out for the identification of various constituents. It answers positively for saponins, flavonoids, Phenolic compounds, tannin, terpenoids and steroids (Tables 4-6). The extracted compound identified compare with standard sample (Gallic acid) by TLC. It was performed using solvent system only glacial acetic acid (10 ml) with 5% ferric chloride (fecl3) as detecting agent. The result observed in the R f values of standard (0.93&0.87), tannin rich fraction R f value (0.91 and 0.85). The results were reported in Tables 7-9. Table 9. In vitro anti-inflammatory activity of Psidium guajava Linn. Bark and leaf ethanolic extract by HRBC membrane stabilization method. inflammatory and antibacterial activities. The tannin rich fraction of leaf and bark of the plant was formulated in the ointment form and studied for wound healing activity. Phytochemical screening was carried out to identify the phyto constituents present in the ethanolic extracts and its fraction. Phytochemical screening of tannin isolation shows the presence of tannin. The total tannin content was estimated by using spectrophotometer method. The results indicate that the content of tannin was found to higher in the plant. TLC was done for the tannin fraction on support of the chemical test since it showed blue color spot with 5% ferric chloride, confirmed the presence of tannin. It was identified as gallic acid by comparing its R f value with that of standard gallic acid. The test extract exhibited membrane stabilization effect by inhibiting hypo tonicity induced lyses of erythrocyte membrane. The erythrocyte membrane is analogous to the lysosomal membrane and its stabilization implies that the tannin fraction may as well stabilize lysosomal membranes. Stabilization of lysosomal membrane is important in limiting the inflammatory response by preventing the release of lysosomal constituents of activated neutrophil such as bactericidal enzymes and proteases, which cause further tissue inflammation and damage upon extra cellular release .Though the exact mechanism of the membrane stabilization by the extract is not known yet, hypo tonicity induced hemolysis may arise from shrinkage of the cells due to osmotic loss of intracellular electrolyte and fluid components. The test fraction may inhibit the process, which may stimulate or enhance the efflux of these intracellular components .Since tannin rich fraction was found to be more effective in stabilizing the RBC membrane against hypo tonicity induced hemolysis compared to tannin rich fraction in the control of inflammation, tannin fraction may inhibit the triggering of inflammation in acne. From this study, it is concluded that Psidium guajava Linn. Leaf and bark tannin fraction have significant anti-inflammatory In-vitro models. And then based on .anti-inflammatory activity, that tannin rich fraction of leaf and bark of the plant .It showed significant percentage wound protection at the tested concentration. The anti-inflammatory activity is probably due to the presence of tannin (gallic acid). Further studies need to be isolate individual tannin and explore its biological potency by various preclinical and clinical trials of the isolated compounds. AbdelrahimSI, Atragboul AZ, Omer MEA. Screening of Psidiumguajava aqueous bark and methanolicextract and antibacterial activity.Fitoterpia. 2002;73:713-715. Adeyemi. Phytochemical and trypanocidal activity of Ethanolic leaf Extract in rats infected with trypnosomabruceibrucei.Journal of medicinal plants Research. 2009; 3(5): 420-423. Agarwal SS,Paridavi M. Herbal drug Technology. NirliPrakashan Publications, 2007, 1. Kumar A, Tandon S,Naquvi AA,Kahol AP. Composition of leaf and twigs oil of Psidiumguajava.Indian Perfumer. 2005:49(1): 73-75. Chaterjee A, Chandra SP. The treatise on Indian Medicinal Plants.National Institute of sciencecommunication and information resource, New Delhi. 2003; 4: 14-16. Kumar A, Lakshman K, Jayaveera KN. Estimation of Gallic Acid,Rutin and Quercetin in Terminaliachebulaby HPTLC. Jordan Journal of Pharmaceutical Sciences.2003; 3(1). Amarawiez R, Traszynska A, Pegg RB.Antioxidative and radical scavenging effect of phenolics from Viciasativum.Fitoherapia. 2008; 79: 121-122. Chanchal KR, Jagadeesh V, Kamath.The hepato protective activity of Psidiumguajava Linn.Indian Journal of Expermental Biology. 2006;44:305-311. Dhara AK,GebremariamB,chowdaryN. Neuropharmacological evolution of Psidiumgujava fruit .Indian Journal of pharmaceutical sciences. 1994;56 (4):164 . Deguchi Y,Miyazaki K.Anti-hyper glycemic and anti-hyperlipidimic effects of guava .Phytopharm. 2010;11(03):26. Fatima S, Jadhav MJ. Studies on brown rot of guava: isolation,pathogenicity and control. Bioinfolet. 2006; 3(1):74. Fu HZ,Luo YM, Li Cj. Isolated psidials.Phytopharm. 2010; 11(02): 31. Razak FA, Yasmin R, thman O,Zubaidah. The effect of Piper beetle and Psidiumgujava extracts. Journal ofOral sciences. 2006; 48: 71-75. Gandhisan R.Thamaraichelvan A.Baburaj. Antiinflammatory action of LanneacoromandelicaHrbc membrane stabilization,Fitotherapia1999; 62:82-83. Gorman, Zheng,Wang.Antioxidant and antiproliferative activities of methanolic extracts of Perillafrutescens. Journal of Medicinal Plants Research. 2010; 4(6):477-483. Gupta VK,MisraAK,.Gaur RK. Current status of fusarium wilts disease of guava. Journal of Biotechnology. 2010; 9(2): 176-195. Harborne JB. Phytochemical method guide to modern technique of plant analysis.Springer. 1998; 83. Joshi SG. The Indian Medicinal Plants. Oxford and IBH Publishers,2003; 293. Jimenez A, Rincon M, Pulido R, Saura-Calixto. Guava fruits as a new source of antioxidant dietary fiber. Journal of Agricultural and Food Chemistry. 2001; 49(11):5489-5493. Jairaj P, Ongkrajang Y, ThongapraditchoteS. Effect of Psidiumgujava leaf extract on the bleeding time. Phytotherapy Research. 2000;14(5):388-391. Ji XD, Pu QL, GarraffoM.Characterization of the compounds presentin the essentialoil. Journal of essential oil research. 1991; 3(3):187-189. Kaudil FE, EI-Sayed, Michael NH. Flavonoid composition of the leaves of Psidiumguajava. Asian journal of chemistry. 1997; 9(4):871-872. Khare CP. The Indian Medicinal Plants. An illustrated plants Dictionary. 2007; 522. Kiritikar, Basu, The Indian Medicinal Plants. International Book Distributors Publishers, Dehardun, 1999; 2: 1046. Kalyon Roy,Shivakumar H. Wound Healing Potential of Leaf Extracts of FicusReligiosaon Wistar albino strain rats. International Journal ofPharm TechResearch. 2009;1(3): 506-508. Luna S, Sandoval E, Lozoya. Anatomical characteristics of matured guava leaf and Quality control of the herbal raw material. Fitoterpia. 1986; 9:223-229. Lal G, Sen NL. Effect of nitrogen,zinc and manganese fertilization on soil composition and yield of guava.Hamdardmedicus. 2003; 46(3): 82-85. Lutterodt A. Ismail RH, basheer. Inhibition of microlax-induced experimental diarrhoea with narcotic like extracts of Psidiumgujava. Journal of Ethnopharmacology. 1992; 37(2):151-157. Matsuzaki K,Ishii R,Kobiyama.Structures of new benzophenone and quercetingalloyl glycosides. Phytopharm. 2010;12:41. Mercadante A, Steck A,Pfander.Carotenoids from the flesh of Brazilian red guavas.Journal of Agricultural and food chemistry. 1999; 47(1):145-151. MeckesM.CalzadaF.Tortoriello. Depressant activity of isolated terpenoids from Psidiumguajava.PhytotherapyResearch.1996;10(7): 600-603. Mehrota B.N., and RamP.Rastogi, Compendium of Indian Medicinal Plants. CDRI Publishers, Lucknow, 5: 700. MoshraFuddin Ahmed, The Indian Medicinal Plants. MJP Publishers, Chennai,2007: 376. MuruganandanS, Srinivasan K, Tandan,SK. Anti-inflammatory and analgesic activities of guava. Journal of Medicinal and Aromatic plant sciences. 2000;22: 56-58. Misra SB, Dixit SN., Anti-fungal activity of leaf extracts of 14 plants including Psidiumguajava. Acta Bot. India. 1974; Volume 7 (2):147-150. Metwally AM. Antimicrobial activity offive flavonoid compounds.Pharmacognosy magazine. 2010; 6:212-218. Nadkarni AK.The Indian MateriaMedica.1976; Popular Prakashan Publishers. 1: 1018. Niazrahim, Donald james, Haruowatanabe. Antibacterial activity of Psidiumguajava leaf and bark against multidrug resistant Vibrio cholera. Jpn J Infect. 2010; 63: 271-274. Okwu DE. Phytochemicals. Vitamins and mineral contents of two Nigerian medicinal plants. International Journal of Molecular Medicine and Advanced Sciences. 2005;1(4): 375-381. Bello OII, Odusanya AJ,Raji. Contractile effect of the aqueous extactof Psidiumguajava.Fitoterapia. 2007; 8 (3): 241-243. Obasi BNB,Igboechi CA. Effect of extracts of Newbouldialevis,Psidiumgujava and Philanthusanarus on gatro-intestinal tract. Fitoterapia. 1993; 64 (3):235-238. Oliver-Bever.Bep: Medicinal Plants in tropical West Africa. Cambridge University Press, Cambridge. 1986. Prajapathi, Purohit, Sharma, Kumar. The Hand Book of Medicinal plants. A complete source book.2007; 427. Rattanachaikunsopon P, Phunkha P.Antibacterial activity of flavonoid. Journal of medical plants Research. 2010; 4 (5): 393-396. Rattanachaikunsopon P, Phunkha P.The antimicrobial activity against Fish bacterial pathogens of flavonoids.Fitoterpia. 2007; 78: 434-436. Prabu GR, Gnanamani AS. Anti streptococcus mutant activity and the in-vivo effects of sub minimal inhibitory concentractions of guajaverin. Journal of applied Microbiology. 2008;101: 487-495. Rajkumar DV, Rao MNA. Dehydrozingerone and isoeugenol as inhibit lipid peroxidation and as free radical scavengers, Biochemistry and Pharmacology. 1993; 2: 2067-72. Gutierrez RMP, Mitchell S. Chemical constituents and pharmacological uses ofpsidiumguajava. Journal of Ethanopharmacology. 2008; 117: 1-27. Ram PR, Mehrotra BN.Cmpendium of medicinal plants. CDRI.Lucknow. 1960. SR Sharma,RajendraK. The biological active compounds of Psidiumguajava. Journal of scientific and Industrial Research. 1999; 58(6):414-421. Santos F A,Silveira VSN. Investigations on the antinociceptive effect of guava leaf essential oil and its major constituents. Phytotherapy Research. 1998; 12(1): 24-27. Sang-Bong leel.Anti-cancer activity of guava. Journal of Medicinal Plants Research. 2010; 4(10): 891-896.